1st attempt 385: This was a little f***ed up. I had Elton wrap my knees too early so by the time I got to the platform my legs were basically numb. Compound that with my mistake of making my rack height too high and having to reset it and by the time I squatted I had no feeling in my legs and I ended very high on the squat and missed it. This really should have been a gimme, so I didn’t sweat it and went up on my second attempt. By the way, I didn’t find out until later that day that if you miss all three of your squats you are out of the meet. I guess it was better I didn’t know that. 2nd attempt 424: My PR is 425, but I still had no fear here. I knew I could get this and I did. 3rd attempt 451: This was my goal going in. I felt good. The 424 was easy and I was pretty sure I could get this. I unracked it, went down, stood up and then heard the annoucer say, “No good.” I asked the judge why and he put his thumb and first finger about half an inch apart indicating that I was above parallel by that much. Here’s the video. Judge for yourself. It was right around here that I started getting a bit tired. 1st attempt 248: This wasn’t too bad. Not a piece of cake, but not too bad. 2nd attempt 264: Here we go again with the bench. Got about half way up and that’s it. I did this weight a few weeks ago at the gym, but not today. My goal was 270 going in. That wasn’t going to happen. 3rd attempt 264: One word: Stapled. Now I was definitely tired and a bit frustrated. I was two for six and missed the first two goals I had for the day. I was talking to Shane and he suggested a Red Bull. Not a bad idea. He also introduced me to the wonderful world of Ammonia. That woke me up a bit. I knew that the deadlift was my best lift and I actually felt good warming up, so I was cautiously optimistic that I could hit my 500 lb. goal. 1st attempt 405: Went up easy. 2nd attempt 461: Not too bad, but I really didn’t know if I had another 40 pounds in me. I decided that I was going to give a shot anyway. I did 473 last time so there really was no point in just matching that or going up just 10 pounds. 3rd attempt 501: Not too bad at all. Took a second or two to get off the floor, but then flew up. My sticking point with deads is off the floor, so I knew that once I moved it off the floor a little I was fine. I was a little hesitant until I saw the three white lights and then I gave a little yell. The 500 pound mark is a pretty good mark. I feel that you are starting to get somewhere once you break 400, but breaking 500 means that you are strong. This one felt real good. Check out the video. So, all in all a decent day. My 1167 total was 32 pounds more than my total at the March 13th meet, so I’ll take that. I really wanted more, though. Weighing 198 pounds, an elite total is 1471. That’s a big number. I just have to get my bench moving. I simply will not hit that total until I do. I figure something like a 565 squat, 300 bench, 615 deadlift will get me there. It just seems like that bench number is pretty darn small comparitively. I need to figure out what is the sticking point there. We’ll get it done. Anyway, a big thank you to Elton, Shane, Andy and Jesse for helping me out at the meet. It was also a nice unexpected surprise to see to see Eric Kenyon RKC there. Anyway, let me know what you think or if you have any thoughts or suggestions. Thanks for reading and I’ll talk to you soon. Long before I was a trainer, I just loved going to the gym. I read books and magazines about training and I tried lots of things out. When I look back, I realize that while many things I did got positive results, I definitely made mistakes along the way. What I’d like to do this week is tell you a few of my mistakes so that you can avoid making them. 1. Don’t use body part splits. For those that don’t know, many people lift weights according to a schedule of body parts (chest and triceps on Monday, back on Tuesday, etc.) usually hitting each body-part once a week. A standard workout will have someone doing three exercises of three or four sets per body-part. There has been a lot of research done on this and it has been shown that hitting a body part with one exercise three times per week yields greater gains in strength and muscle size when compared to three exercises once a week. There are exceptions, but those usually apply to higher level athletes and bodybuilders. For most people, at least initially, a full-body workout is the way to go. 2. Have well-defined goals. A goal is the seed from which everything grows. Without knowing what you want, how do you know what to do? If you want to gain or lose weight, figure out how much. If you want a better bench press, figure out a number. The goal tells you everything you need to know. It tells you how to eat, how much to lift, how much cardio. It gives you purpose. Don’t be one of those vacant-eyed drones shuffling along on the treadmill for no reason. 3. Measure your progress. Once you have a goal, how do you know you are doing the right things to hit it? You’ve got to measure your progress so you can make any necessary adjustments in your program. This doesn’t mean change everything the moment you don’t notice a change, but measuring your progress over time lets you know if you are on the right track much quicker than guessing. 4. Get help. I lifted for far too long by myself and a result developed some bad habits and fell into a bit of a rut. Don’t be afraid to get some help with your exercise program and especially your exercise form. This will help prevent injuries, will help to keep you motivated and will help put you on the fast track to your goals. While this certainly doesn’t get into all of the mistakes I’ve made in my exercise career, hopefully it will give you an idea of how to avoid at least a few of them. If you have any questions about how to avoid your own mistakes, please drop me a line or give me a call. Also, be sure to see your doctor before beginning any exercise program. Hello everyone! I'm on my way up to Sacramento for tomorrow's meet. I hope to hit some good numbers. 450-squat. 270-bench. 500-deadlift. I feel good and am really ready to go. Follow my Facebook page during the day tomorrow for real time updates and I'll have a more extensive recap here next week, hopefully with some video. Wish me luck! Hello all! I just wanted to give everyone a quick update on what is going on. 1. I am running some really great deals on one-on-one and small group sessions at both my San Leandro and my Pleasanton gyms. Drop me a line or give me a call for the details. If you like, I’ll send you a flyer. By the way, my small group sessions can have up to five people and for some of the packages it comes out to less than $20 per person per session. 2. On a personal level, I am currently finishing up my training cycle for my next meet which is in Sacramento on May 23rd. I’m very excited. If you remember at my last meet (which you can read about here) my goal going in was an 1100 pound total. I was very happy to hit 1135. At this one, my goal is 1200. I think I can hit a 450 squat, a 265 bench and, maybe, a 500 dead. That would put me at 1215. Those would be pretty big numbers for me and they would represent a massive gain from just six months ago. I’m feeling good and I’m excited. I’ll let you know how it goes. I’ll leave you with a video of one of the guys I train squatting 1003 pounds. He’s quite a bit stronger than me. Hello, everyone! The idea for this week’s column came from one of my readers. Unfortunately when we spoke I forget to get her name, so if it was you, please call or send me an email so I can give you credit. Anyway, after my last “Apple A Day” nutrition column she called me and mentioned that she had been in the grocery business for a number of years and was appalled at what was happening with our food. She mentioned that she’d like to see an article that talked about what to look for when grocery shopping. I thought that was a great idea, so here we go. 1. Stick to the outer edges of the store. What do we find on the edges of the big box known as the local grocery store? Fruits, vegetables and meats for the most part. What should the vast majority of our diet consist of? You got it! Fruits, vegetables and meats! By the way, if you’re a vegetarian, the tofu is in the vegetable aisle. 2. If it takes ten minutes to read the ingredient list you probably shouldn’t buy it. The fewer the ingredients in any food the less that food has been processed and the better and more complete the nutritional value. 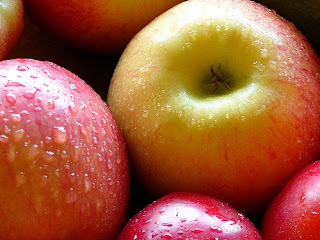 What are the ingredients in an apple? An apple. 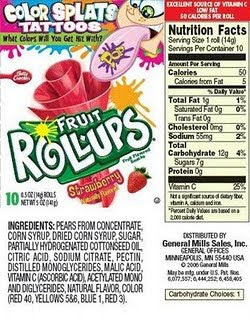 What are the ingredients in a fruit roll-up? Well, out of the 17 things on the ingredients list of General Mills’ Fruit By The Foot, only sugar and water were not either a highly processed food or a chemical. Mmmm, this Acetylated Mono and Diglycerides tastes great! Which one has better ingredients? 3. There’s nothing wrong with frozen veggies. On the excellent show “Jamie Oliver’s Food Revolution” (Friday nights at 9 on ABC), Jamie pointed out that frozen vegetables are picked when ripe and then frozen very soon afterwards, preserving the nutrients extremely well. This can help save some money and make sure that your broccoli doesn’t go bad. 4. High fructose corn syrup isn’t good. Basically, for reasons that I barely understand, our country produces a incredible amount of corn. Far more than we could ever eat. For this reason new uses for corn had to be discovered such as ethanol and the aforementioned high fructose corn syrup. High fructose corn syrup is used as a super cheap sweetener in all sorts of fruit drinks, sodas and many other foods, as well. While there is conflicting research on it’s health effects, it does seem like foods that contain high fructose corn syrup are much more likely to be, in technical terms, garbage. Well, I hope this gives you some basic tips. As always, let me know if you have any suggestions or questions. Eat well and have a great week!